The mother of a man accused of killing a popular University of Mary Washington student activist last year took the stand for the defense Tuesday to explain her text messages with her son that day and describe his worrisome behavior in the previous weeks. Steven Briel, 30, pleaded not guilty to charges of first-degree murder, strangulation and abduction in the April 17, 2015, death of 20-year-old Grace Mann at the Fredericksburg, Virginia, home they shared with two other roommates. Police say Briel strangled Mann, and the defense is trying to show Briel was insane at the time. Mary Briel testified she began to worry about her son in the weeks before Mann’s death. When he sent his parents a rambling, troubling email, Mary Briel testified she thought he might kill himself. He also expressed concerns about his roommates. Northern Virginia Bureau Chief Julie Carey reports on the first day of the trial of Steven Vander Briel in the murder of University of Mary Washington student Grace Mann. His mother recalled a visit home five days before Mann’s death. "He did mention he felt the girls were going to kill him and make it look like a suicide," she testified. Briel’s parents urged him to give his roommates notice and move out. The morning of Mann’s death, Briel confirmed plans with his mother to take the train home, she testified. That afternoon, he sent a text message saying he was cleaning the house. During the following 30 minutes, Mann was strangled. Then Briel sent another message to his mother, writing, “Hey, made a mess. Someone's at the door knocking. What should I do? Run?" “I know. I'm scared,” he replied. “Pack your clothes and get to a coffee place until the next train comes. Stat!!! !” Mary Briel texted back. She testified Tuesday she did not know what he was scared about at that moment. “Get to the bus. You still have time,” she wrote back. When she got home a short time later, she got a message from Fredericksburg Police and learned her son was accused of murder. Before the defense began its case Tuesday, Mann’s roommate Kathryn Erwin testified for the prosecution about confronting Briel, introducing herself as Mann’s best friend. 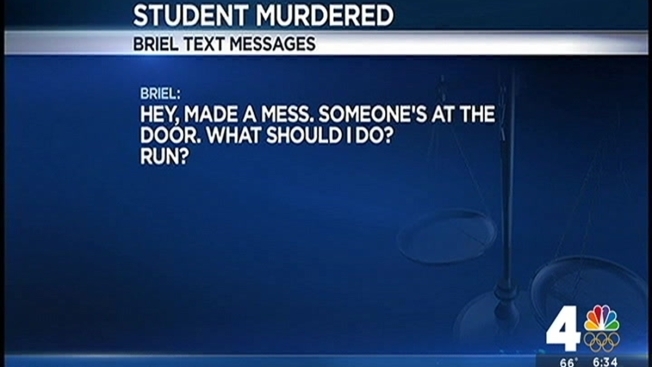 She testified she received puzzling text messages from Briel as she and another roommate walked home that afternoon. "I made a mess in Holly's room," texted Briel, referring to roommate Holly Aleksonis. Once the roommates were in the house, Briel emerged from a room. "He'd sweated through his shirt. He seemed confused,” Erwin testified. Briel then asked what she would you do if Mann wasn't there anymore. Erwin said she ordered Briel to go upstairs to his room, then she spotted Mann, whose skin was blue. Mann’s parents broke into tears as prosecutors played Erwin’s 911 call. She can be heard counting out her CPR compressions -- the number rising higher and higher -- with no response from Mann. Aleksonis testified Monday about returning to the home and finding Briel drenched with sweat and speaking very quickly. 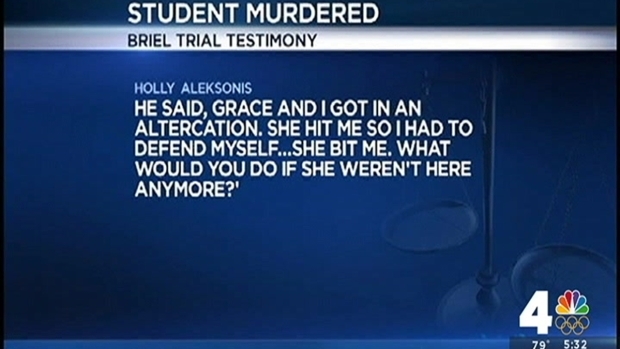 She testified he stood before a closed bedroom door and said, "Grace and I got in an altercation. She hit me so I had to defend myself ... She bit me. What would you do if she weren't here anymore?'"